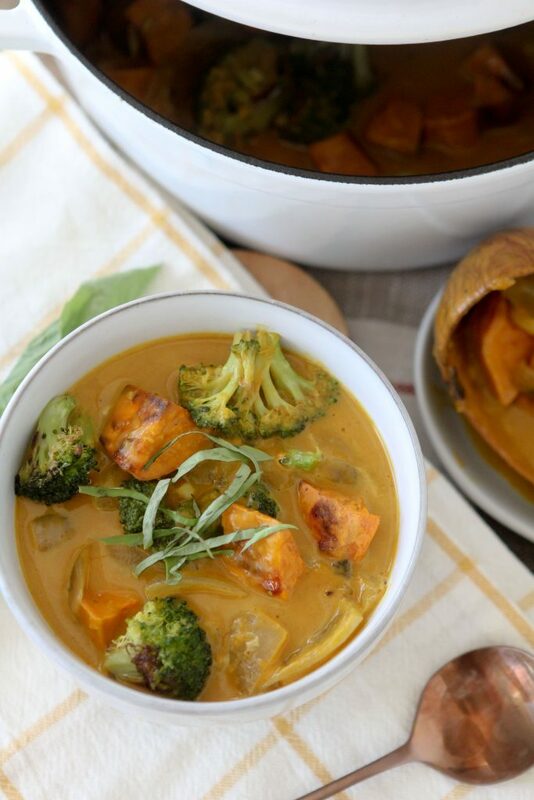 This Pumpkin Curry from The Whole Smiths is the perfect balance of traditional spice, fall and comfort food combined into an easy to make meal. Even better is that it’s paleo, Whole30 compliant if modified and gluten-free. While it’s also vegan as-is, feel free to add your favorite protein it if that’s your preference. Anyone sick of pumpkin yet. Clearly I’m not. I’m cranking out allllll this pumpkin this year and I’m all about it. Pumpkin Curry is happening. However, there ain’t no shame in my pumpkin game friends. Can’t stop, won’t stop. Although, this might be might last pumpkin recipe for the season. That means you’re either crying in a corner of bathing a sigh of relief. In case you’re one of the crying-in-the-corner types, head over to my Pumpkin Pie Egg Muffins or my Grain-Free Cinnamon Swirl Pumpkin Bread to drown your sorrows. All of this pumpkin craze of recent years has really got me thinking. When did it really begin? I mean, yeah, growing up pumpkins were always part of the season. We had pumpkins at Halloween, pumpkin pie at Thanksgiving and fall foliage decor had always included pumpkins. But when did it become a thing? Was it in part due to America’s love affair with the pumpkin spice latte? 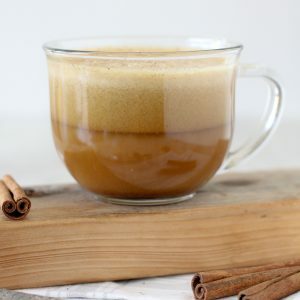 (Which you can find my better-for-you Paleo Pumpkin Spice Latte here.) Perhaps it was the advent of social media where everything is now viral and “must-have”. Whichever it was, I’m here for the pumpkin. Pumpkin, sweet potato. Potato, potahh-toe. For all of this pumpkin talk I have to tell you… I swapped some of the pumpkin in this out for sweet potato. Did I just blow my entire credibility with you? First, yes. 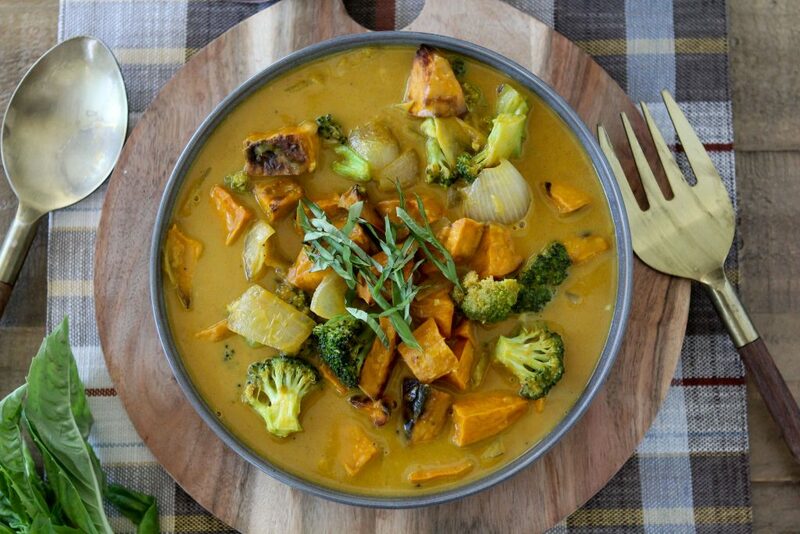 This is a Pumpkin Curry with pumpkin. But I had the option to add even more pumpkin in the form of roasted pumpkin. And I chose not to. Instead, I roasted up some sweet potato cubes to add into the curry. The reason for that is because I know that you are more likely to roast up some sweet potato than buy a baking pumpkin and toast that up. It’s less cumbersome and you’ll be able to make it year around should you choose. Finding a pumpkin to roast in February is nearly impossible and would make this a difficult recipe to enjoy. But a sweet potato? Year around baby! Canned pumpkin? Year around baby! Therefore, if you’re reading this recipe and it’s fall and you’d like to swap roasting pumpkin in place of sweet potatoes, go for it. It will be delicious. You can also use butternut squash if you’d like. The options are there for you and no matter which you select. This recipe is too delicious to be seasonal. 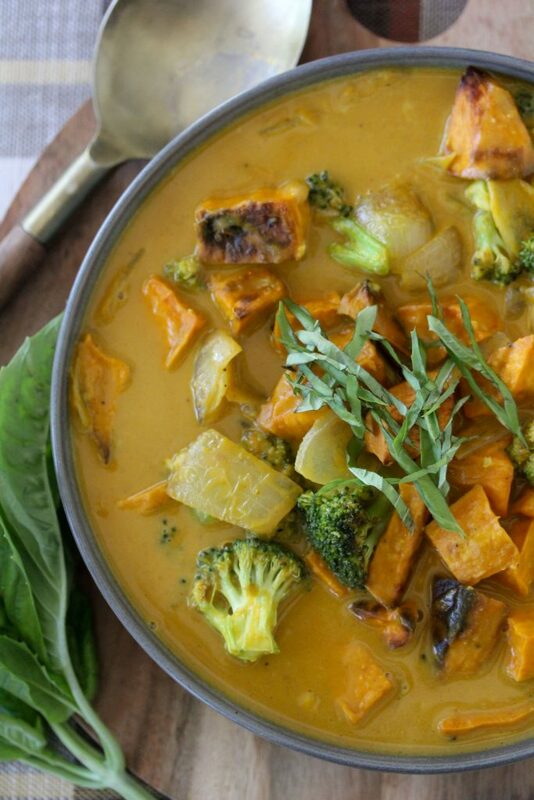 Pumpkin Curry. Let’s do it. While I love spicy foods and curries can often lean on the spicier side of things, this curry is not spicy. For one, if it’s too spicy my kids won’t eat it. But two, I really wanted the warmer spices in this dish to shine through. 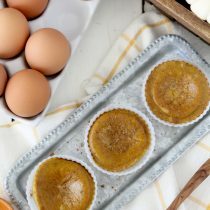 I used a pumpkin pie spice blend to give a solid layer of fall flavor to this recipe and if the dish was too spicy, those notes would get lost in the shuffle. Also, I intentionally made this dish vegan. 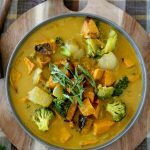 While you don’t find a lot of vegan recipe on this site I wanted to create a hearty meal that was loaded with veggies and available for you to make for your non-meat loving friends. 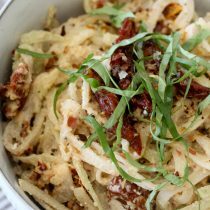 If you’re looking for other vegan options, I might suggest the Sun-Dried Kohlrabi Noodles I made recently. It’s creamy, delicious and totally vegan. As with all of the recipes on my site, I encourage you to make this recipe your own. If you’d prefer to have some meat based protein, add it. I’d cook it in the skillet / pan / dutch oven first, remove it, cook the rest of the recipe as is and add it back in the end. Chicken and ground turkey would both be delicious options in this one. If you’re doing a Whole30, I highly suggest adding some protein in. Hello, do you have any curry? Here’s the part of my blog post that I’ve run out of things to say about this dish. I mean, I could turn it into a thesis about curry and the history of curry but I highly doubt that’s why you’re here. It’s a simple recipe with simple technique so there’s very little to loop you in on technique-wise. I’ve tried to come up with an engaging, personal story about curry but I don’t have any stories from my non-existent summer abroad in India. But for SEO purposes, this post should be longer. And you deserve some entertainment. So maybe I tell you about when I lived in San Francisco back in my 20’s and my roommate and I would come home after the bars and prank call our friends asking if they had any curry on hand. It was somewhat on rotation and we thought we were high-larious. Literally, if you get what I’m throwing down. How and why I am confessing this now all for the sake of this post is beyond me. But truly, at the time I cannot remember laughing so hard. My friend is an incredible actress and never broke character. The number of friends and guys we were dating (or had made out with) that continued to chat with a stranger looking for curry was, and is, mind-boggling. I would have hung up in a heartbeat. Or more likely not even answered a midnight call. If you were one of those people baffled by your weekend curry call… that was us. I’m… sorry. But thank you for giving us endless entertainment. Oh no. Now I’ve said too much and tarnished my reputation as a serious, no-nonsense, straight-laced cookbook author. Just kidding, I never had that reputation. Bring on the nonsense. 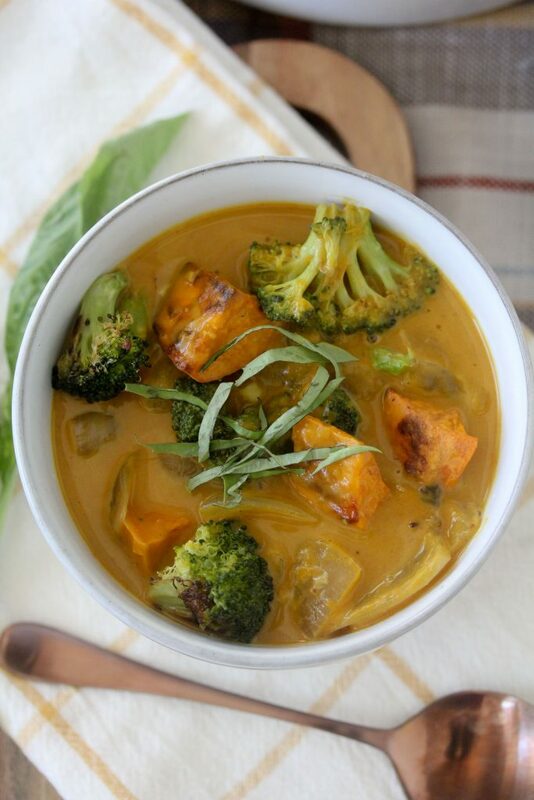 And the Pumpkin Curry. Enjoy! 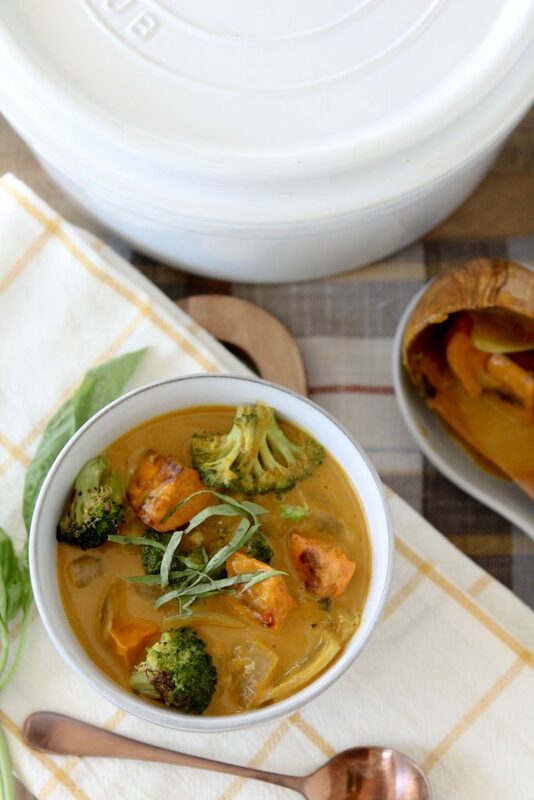 This Pumpkin Curry from The Whole Smiths is the perfect balance of traditional spices and seasonal delight. You can feel good about eating it too! It's paleo, Whole30, dairy-free and even vegan. Preheat the oven to 425* F. Line two baking sheets with parchment paper. Add the sweet potatoes, 1 tablespoon of olive oil and 1/2 teaspoon of salt to a large bowl and toss to coat the sweet potato evenly. Spread evenly onto one of the parchment-lined baking sheets and roast for 45 minutes. In the same bowl add the broccoli, 1 tablespoon of the olive oil and another 1/2 teaspoon of salt and toss to coat. Spread the broccoli in an even layer onto the remaining baking sheet and bake at 425*F for 20-25 minutes. While the vegetables roast heat a dutch oven (or large pot) over medium heat and add 1 tablespoon of coconut oil. Once the oil is hot, add the onions and 1/2 a teaspoon of the salt and sauté until the onions are golden brown and lightly caramelized, about 7-8 minutes. Add the ginger to the onions and stir while it cooks, about 1 minute. After one minute, add the garlic and stir for an additional minute. 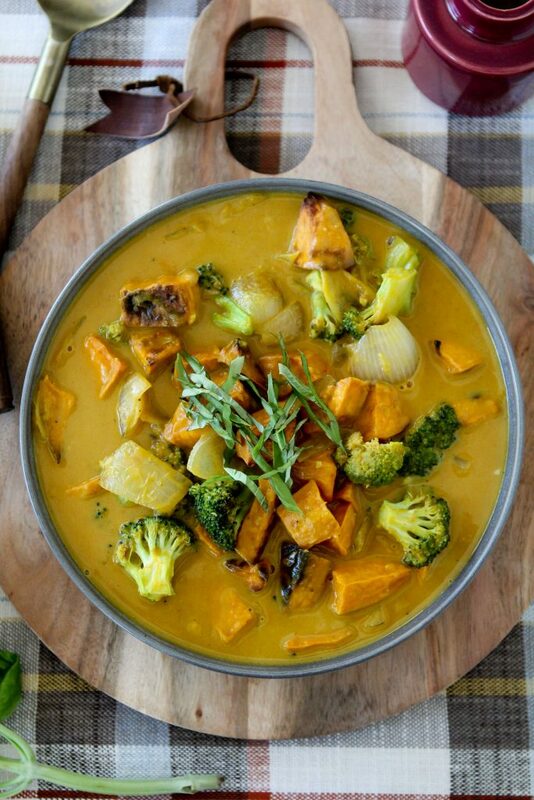 Next, add the pumpkin, coconut milk, broth, honey, curry powder, remaining teaspoon of salt, lime juice, smoked paprika, pumpkin pie spice, and black pepper to the pot and stir to combine. Bring the curry to a simmer and continue to simmer covered for 10 minutes. Add the roasted sweet potatoes and broccoli to the pot and stir to combine. To serve, pour the curry into a bowl and garnish with a generous pinch of basil. I made this for dinner tonight, and we enjoyed it! It was perfect because we had these ingredients that needed to be used. Thanks for the recipe.